How clear of a picture do you have of your character? When we think about them, we often have the details of the face, hair, and even body shape clearly formed. From the narrow beak-like nose to the wayward mess of dark curls. These are the very foundation of your character’s physical appearance, so of course it is the first thing we consider. Clothing offers an extra layer to the development of your character. Look at the people you find walking down a busy street. What are your first impressions from their choice of clothes? Are they in uniform ready for work? Do they look like they’ve just rolled out of bed and put on the first shirt they found? Whether someone is fashion clueless or a diva of style – what you wear reflects who you are as a person and what you do. It can reveal your interests, feelings, social rank and more. It can also hide a truth, simply by dressing in a way that manipulates perception. 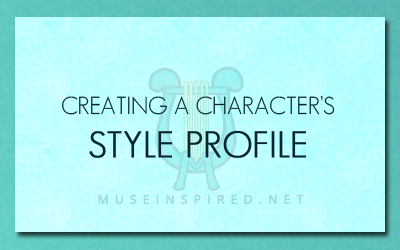 Here is an exercise on discovering your character’s style profile. When deciding on a style profile for your character, consider the little details. What are they showing the world? What are they trying to hide? Why would they choose to buy that particular article of clothing? Do they like dressing casual because they are a relaxed person? Do they only wear fancy super model fashions because they feel it makes them look more important? Are they obsessed with multicolored socks because they are weird and quirky and it’s the only way they can express it? …a young woman wearing a black leather mini skirt, vibrant flower print tube top, bright red lipstick, and six inch heels. …a dude wearing stained sweat pants, a ripped band t-shirt, a nose ring, and is covered head to toe in dirt. …a man in a spotless, well tailored blue suit with a banana-print tie, an Italian leather briefcase, and scuffed suede shoes. Now, taking it a step further: Are the first impressions the correct one? What might be the deeper story behind these clothing details? Are they always freshly showered, or are they dirty? Is there a kind of mess where you can see hints of their job/hobby? Example: Covered in hair as a hairdresser, paint splatters as a painter, concrete dust as a construction worker. Are they well manicured and groomed? Do they keep their hair super neat and tidy or is it messy? Do they groom their facial features like shaving, or eyebrow plucking? What about their nails? Do they wear makeup? What kinds and styles? Do they wear jewelry or other accessories? Earbuds for music or wireless cellphone? What kind of fashion sense do they have? Do their clothes match? Do they look well put together or does everything look thrown own with no thought? Do they prefer casual clothes? Work clothes? No clothes? What sort of style would people say they have? Country? Punk? Glamor? What colors do they tend to wear? Do they wear these colors on purpose, or is it just something they tend to be drawn to? Do they have a favorite article of clothing? What sort of underwear is under all of those clothes? Are their clothes following current fashions? Old fashioned? Do they dress with a specific time period in mind, or do they dress according to local customs? What condition are their clothes in? Dirty? Filled with holes? Well maintained? Brand new? Hand-me-downs? Do they spend a lot of money on their clothes or do they shop more frugally? Where do they typically buy their clothes? Need ideas or inspiration? Shop around! A great thing to do when creating your character’s style profile is to actually shop around. Look at fashion websites or check out magazines. Watch a TV show or movie that’s related to your genre and see what kind of wardrobe the characters are in. I am also a big fan of websites like ShopLook, UrStyle, and TrendMe where you can create your own fashion sets and browse sets made by others. It’s a fantastic way to get a visual on what the styles would look like and an easy reference for when you’re writing out those details on a character’s favorite trench coat or the heeled shoe they just broke. Character Development - Do they have siblings?